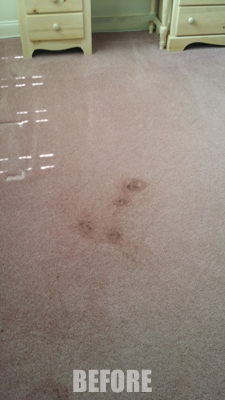 This Tampa FL home owner was not sure what these tough carpet stains were but they had been there for a while. We love tough unknown carpet stains. They give us a chance to test our own knowledge and skills to remove them. Some are easy and some are difficult, but the end result is usually the same. We get them out. This home owner was pretty sure these stains were permanent. Her carpet was ten years old and she had used several over the counter spot removers without success. She was even told by another professional carpet cleaner that these stains would most likely never come out. We took that as an official challenge. 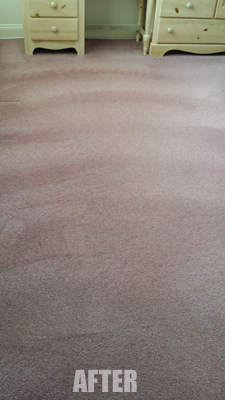 We used a couple of different solutions and were able to lighten the stains during our general cleaning process, but the stains were still visible. After talking with the home owner she told us that this was the last ditch effort before replacing the carpet all together. That’s when we told her about Chem-Dry’s stain out process. Stain out is our last resort stain remover. It attacks stains at a molecular level by opening the carpet fiber dye sites and removing the stain. It’s a truly amazing system. It removes all types of tough stains like: ink, blood, kool-aid, and even red food coloring. It’s our go to system when all else fails. Although these particular carpet stains were stubborn we were able to remove them and bring her carpet back to “like new” condition. The home owner was so impressed she asked us to clean more rooms. And recommended us to her neighbor who had a couple of tough stains she was unable to remove. Call Chem-Dry of Tampa FL for all your tough stains.